We approach environmental challenges with a vast knowledge of how to restore rivers, lakes, streams, and ponds through creative, long-term solutions. Considerable experience with the construction, maintenance, and removal of dams, also helps us guide clients towards effective infrastructure solutions while identifying opportunities for environmental improvement. With a passion for natural resources restoration and enhancement, our team of engineers, environmental scientists, planners, and landscape architects is prepared to take on any project regardless of complexity. With extensive expertise, we’re able to design projects grounded in sound engineering while optimizing the environmental quality, economic vitality, and aesthetics of natural systems. A holistic approach to overcoming project challenges propels us to develop high-quality, cost-effective solutions that attract public interest and foster environmental awareness, interest, and stewardship. By establishing strong relationships with various regulatory agencies, we’re able to navigate the environmental permitting process with ease and efficiency to keep your project on time and budget. Unstable stream channels can threaten nearby properties or structures, and the ongoing erosive cycle of streambank undercutting and sloughing degrades water quality. Sediment from bank erosion and upstream development can eventually fill lakes and ponds located downstream, severely affecting water quality and habitat. Streambank Stabilization & Restoration – The single largest source of pollutants for most streams is streambank erosion. We have stabilized miles of streambank with a wide range of practices while keeping an eye on the natural environment. 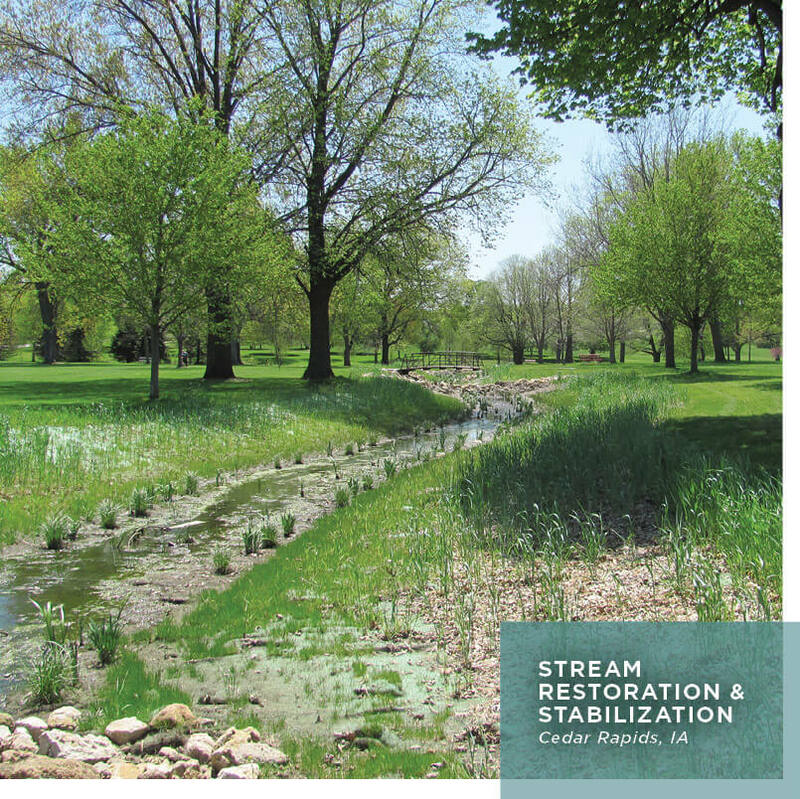 Creating a project that takes into account habitat, aesthetics, and long-term capacity, in addition to streambank stabilization, provides the best combination of engineering and environment. Channel Realignment – Some projects require realigning an existing drainage channel. We design these channels to protect public safety, meet all permit requirements, and match the preexisting channel conveyance and habitat as closely as possible. Recreational Enhancements – Our planners and landscape architects can help weave recreational features into all types of stormwater projects. Over time, lakes and ponds can transition from regional attractions to nuisances. Sedimentation due to upstream and shoreline erosion causes turbidity and loss of depth, affecting fish and other aquatic species. Pollutants and nutrients entering the water lead to algae and vegetation issues. Lakeshore Stabilization – A lack of shoreline stabilization creates water quality issues, hazardous access conditions, and aesthetic concerns. We assess the best solution to stabilize each shoreline and do it in an environmentally friendly, aesthetically pleasing way. Lake Dredging – Dredging is often the only solution available to bring a lake back to its original storage capacity. We understand how dredging equipment, pumping needs, and dredged material storage must work to achieve project success. Forebay Design – An often-overlooked aspect of pond design is the forebay. A properly designed forebay can add years to the life of a pond through easily accessible sediment removal. 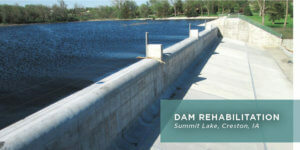 All dams require maintenance, upgrades, and eventual removal. We can help evaluate the condition of your dam and assist with required maintenance and upgrades. While relatively rare, new dams can be built to create water features, provide water supply, create habitat, or improve flow equalization. In recent years, a strong movement has developed to promote the removal of old dams in order to reduce hazards to people and animals, improve stream health and habitat, reduce the burden of maintenance to owners, and provide recreational opportunities. Our team provides cost-effective mitigation for low head dams and is ready to help with your dam project. Dam Removal, Repair, & Modification – To meet today’s evolving environmental conditions, our hydraulic and structural engineers team to complete critical infrastructure repair and modifications. Environmental Improvement – Post dam removal, renovation of the area may be necessary to improve habitat and recreational opportunities.